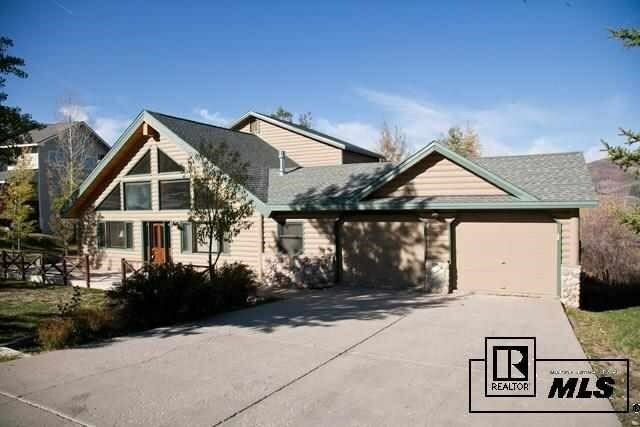 Mountain area home with 3 bedrooms, 2.5 bathrooms, 2-car garage, office/den and rustic accents throughout. This upgraded home with log siding has a spacious great room with vaulted tongue and groove ceilings, lots of natural light, hardwood floors, stunning rock fireplace and wraparound deck with hot tub. Master suite on main level with access to deck and back yard. There is also bonus room that could be used an office, den or play room. The kitchen is nicely appointed with granite counters and newer appliances. Upstairs you’ll find two large bedrooms, full-size bathroom and comfy loft overlooking living room. This home has charming ambiance with log accents inside and out, a wonderful yard, views of the ski area and is located in a great neighborhood just minutes to the ski area!